Saint Joseph, God has appointed you patron of the Catholic Church because you were the head of the Holy Family, the starting-point of the Church. You were the father, protector, guide and support of the Holy Family. For that reason you belong in a particular way to the Church, which was the purpose of the Holy Family’s existence. I believe that the Church is the family of God on earth. Its government is represented in priestly authority which consists above all in its power over the true Body of Christ, really present in the Blessed Sacrament of the Altar, thus continuing Christ’s life in the Church. From this power, too, comes authority over the Mystical Body of Christ, the members of the Church — the power to teach and govern souls, to reconcile them with God, to bless them, and to pray for them. You have a special relationship to the priesthood because you possessed a wonderful power over our Savior Himself. Your life and office were of a priestly function and are especially connected with the Blessed Sacrament. To some extent you were the means of bringing the Redeemer to us — as it is the priest’s function to bring Him to us in the Mass — for you reared Jesus, supported, nourished, protected and sheltered Him. You were prefigured by the patriarch Joseph, who kept supplies of wheat for his people. But how much greater than he were you! Joseph of old gave the Egyptians mere bread for their bodies. You nourished, and with the most tender care, preserved for the Church Him who is the Bread of Heaven and who gives eternal life in Holy Communion. God has appointed you patron of the Church because the glorious title of patriarch also falls by special right to you. The patriarchs were the heads of families of the Chosen People, and theirs was the honor to prepare for the Savior’s incarnation. You belonged to this line of patriarchs, for you were one of the last descendants of the family of David and one of the nearest forebears of Christ according to the flesh. As husband of Mary, the Mother of God, and as the foster-father of the Savior, you were directly connected with Christ. Your vocation was especially concerned with the Person of Jesus; your entire activity centered about Him. You are, therefore, the closing of the Old Testament and the beginning of the New, which took its rise with the Holy Family of Nazareth. Because the New Testament surpasses the Old in every respect, you are the patriarch of patriarchs, the most venerable, exalted, and amiable of all the patriarchs. Through Mary, the Church received Christ, and therefore the Church is indebted to her. But the Church owes her debt of gratitude and veneration to you also, for you were the chosen one who enabled Christ to enter into the world according to the laws of order and fitness. It was by you that the patriarchs and the prophets and the faithful reaped the fruit of God’s promise. Alone among them all, you saw with your own eyes and possessed the Redeemer promised to the rest of men. 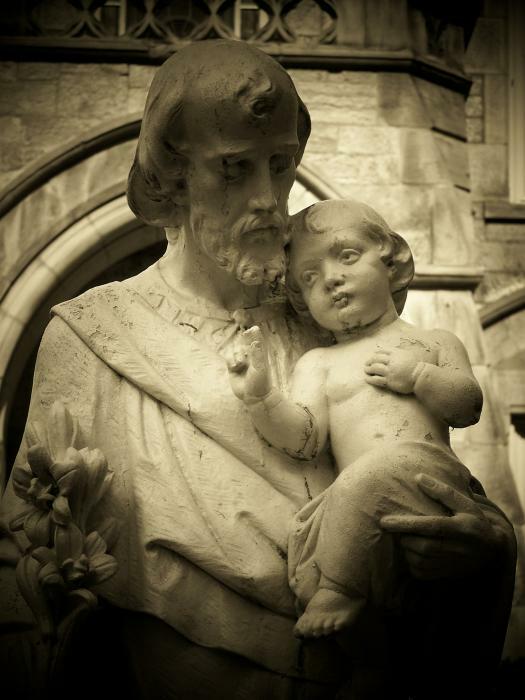 Saint Joseph, I thank God for your privilege of being the Patron of the Church. As a token of your own gratitude to God, obtain for me the grace to live always as a worthy member of this Church, so that through it I may save my soul. Bless the priests, the religious, and the laity of the Catholic Church, that they may ever grow in God’s love and faithfulness in His service. Protect the Church from the evils of our day and from the persecution of her enemies. Through your powerful intercession may the church successfully accomplish its mission in this world — the glory of God and the salvation of souls!